Have you ever wondered what I7 or V7 was supposed to mean? What are these 7s that show up so often? How do you translate the notation into keys on the keyboard? Well, these 7s are known as seventh chords, of which there are 3 different kinds, the major seventh chord, the minor seventh chord, and the dominant seventh chord. What is I7 and V7? Seventh chords are used in compositions to add tension to a regular chord. 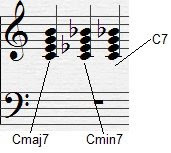 Many times seventh chords are used with blues or jazz music. Indeed, the blues scale is composed of multiple dominant 7th chords. To learn more about different type of scales, including the blues scale, please visit Learn Different Types of Scales. Seventh chords add an additional note to the regular chords to give a fuller, more lush, sound. Pictured above are the three types of seventh chords. On the left is the major seventh chord. The major seventh chord is comprised of a standard major chord with an added major third on top of the existing three notes. The middle seventh chord is the minor seventh chord, which is similar to the major seventh, except that it’s a standard minor chord with an added minor third on top. The next seventh chord is the most popular. Its official name is the dominant seventh chord, but most people refer to it as the seventh chord. The dominant seventh chord is used mightily in jazz music. Hence, the I7 chord refers to the tonic note played as a dominant seventh chord, and V7 refers to the dominant note (the fifth note in the major scale) played as a dominant seventh chord. If you’re interested in experimenting with the seventh chords, try playing them in the chord progression shown in *Exhaustive List of Chord Progression. Notice how the chords sound more lush. Seventh chords are great to add tension to the harmonic progression. As such, they are normally added to the note preceding the finale, similar in fashion to the suspended 4th chord. To learn more about the very useful suspended 4th chord please visit *How to Harmonize a Melody. Perhaps you like the sound of the seventh chords, or perhaps you don’t. Either way they are useful in many types of compositions. Seventh chords are used extensively in blues and jazz pieces and provide the basis of the tension. In the popular style of music seventh chords are used occasionally to add an increase in tension.